Above, The oh so problematic, first attempt, at Quiet Book Pages. Notice the sad fraying edges. The end result of the new process, much more satisfactory! Cut out one 8x16 inch piece of thin batting for each page (front and back). For example, the last quiet book that I made had four separate pages with two pages on each side and two sides to each page (clear as mud). Anyway, there end up being 16 pages total. I cut out 8 pieces of batting cut to 16x8 inches (each individual page will be 8x8, but with two to a page it is 8x16). Cut out one 10x18 inch piece of fabric for each piece of batting (8 total in my book). I chose to have 4 different colors of pages in my book so I cut out two pieces of fabric in each color. Lay one piece of cut batting on top of the wrong side of one piece of cut fabric (center the bat). With fabric pinned and pressed topstitch the material in place 1/4" away from the edge of the fabric, right side up, around the perimeter of the page. You have now completed the first side of your page. Hooray! Now go ahead and complete this process for the other side of your page, and for any remaining pages that you will be completing. 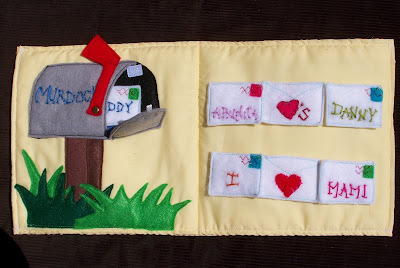 Once you have finished adorning and appliqueing your pages you can stitch the front and back of your pages together, doing so will allow you to encase the ends of your strings. Following this process ensures that all of your raw edges are encased, and I love the look and feel of the pages with the double layer of batting. It also provides more stability to the page when appliqueing. This probably isn't the most exciting post, but hopefully it proves helpful to anyone out there who wants to attempt a quiet book. If anyone has questions leave me a comment or shoot me an email. This is exciting to me! I have never sewn something as ambitious as a quiet book, but I have a long flight with an 18 month old in one year. That should give me time to learn how to make one! There are plenty of page ideas all over the internet, but nothing on assembly for the people who, like me, are clueless when it comes to sewing. Thank you! You have saved me plenty of trial and error! Hello! I'm loving your quiet book info. I especially love this post which told me, a novice, how to make a successful page. I've made 8 pages like you mentioned & am about to topstich. From what I can tell by examining your pages u used 2 rings & button holes. I am going to have to learn how to do a button hole, but my question is.. When do u do the button holes in your process?? I'm worried about lining the pages uP correctly. This was a great post. I started making a quiet book a year ago. It was simple finding a tutorial for the cover but I was afraid to attempt making the pages because I didn't know how to make the pages stiff enough to work. I knew that making the pages stiff yet pliable was the key, just didn't know how to do it. Thank you so much. I'm now recommitted to finishing the quiet book, soon.... Love your site. need to know how to put all the pages together. Please tell us.